Book Your Next Outing Here! Let us do the work & you have all the fun! We also have corn-hole games, horseshoe pits, a moon bounce inflatable, sack races, tug-of-war ropes, an outdoor banquet tent, indoor banquet room and ample parking! 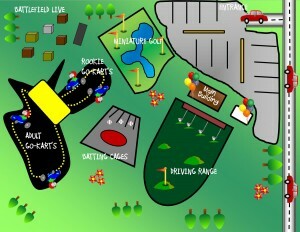 Includes 3 activities per person for up to 12 people. Any additional people are 3 activities for $12 per person. 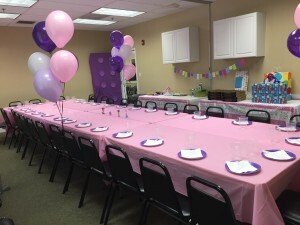 Room is decorate in your team’s color and includes 12 place settings. Each additional hour, add $15. For example, 3 hours of unlimited activities would be $35 per person 12 and under/$40 per person 13 and up. *For exclusive use of the park contact management. Add-on’s can be added to any event for an additional charge. *A non-refundable deposit of $100.00 is required when booking your event. Larger events may require a larger deposit.